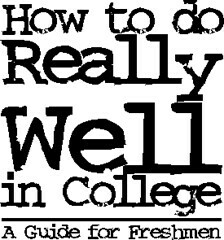 For several years, I’ve been looking for a book for my freshmen on how to succeed in college. It turns out that there are a lot of them, but none of them do quite what I had hoped they would. They talk about study techniques, using the library, keeping a project calendar — that sort of stuff. Now, all of this is useful, but it doesn’t get to the heart of what I think students need to know in order to really thrive in college — not just survive. So, what follows is based on my almost-thirty years as a professor, my work with students, and my discussions with other professors.